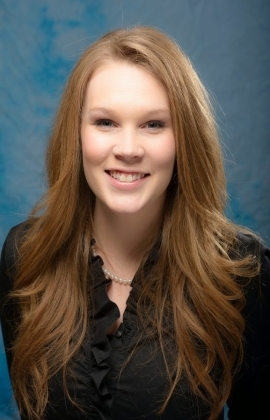 Dr. Elizabeth Betancourt (née Tupper) is a Chiropractor Physician based in Orchard Park, NY who commonly treats headaches, sciatica, pain related to disc herniation, spinal stenosis, arthritis, post-surgical pain, and pain related to pregnancy. 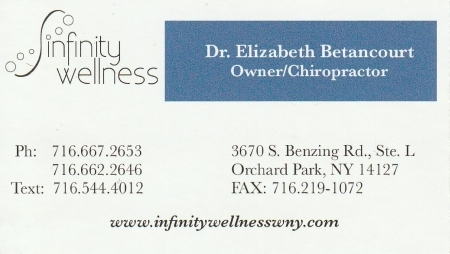 Located at 3670 S Benzing Rd Suite L in Orchard Park, Infinity Wellness has much to offer. Besides chiropractic services, we also offer massage therapy, nutritional counseling, personal training, and whole-body Cryotherapy, which uses cold treatment beneficial not just for inflammatory conditions, but also offering a feeling of overall wellness! Our goal here at Infinity Wellness is to bring optimal health and wellness to the people of Western NY! I'm so excited to share this experience with you! Please call or stop in and make an appointment. I'll be happy to see you!